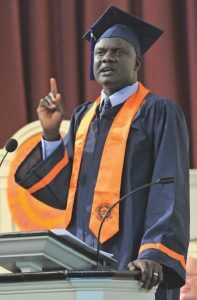 When John Dau stood at the podium in Hendricks Chapel to speak to his fellow graduates at the 2011 University College Commencement Ceremony, his message was one of hope and gratitude. The Sudanese native reflected on an educational journey that didn’t even begin until he was 17, when he first learned to read and write by scrawling letters in the dirt with his finger. In the rural village where he grew up in South Sudan, he had never even heard of something called “school.” There was only suffering and violence as a civil war raged throughout his childhood. Forced from his home and family at the age of 12, John joined a group of 30,000 homeless refugees who came to be known as the Lost Boys. They wandered, barefoot and hungry, through more than 1,000 miles of desert, until they found refuge in a camp in Ethiopia.